On Thursday 15th September 2016, the Northern Ireland Zwartbles Sheep Association held their annual branch show and sale at Ballymena Livestock Market for pedigree and commercial Zwartbles sheep. The judge for the evening was Mr Martin Preston from the Greenhill flock in West Yorkshire. 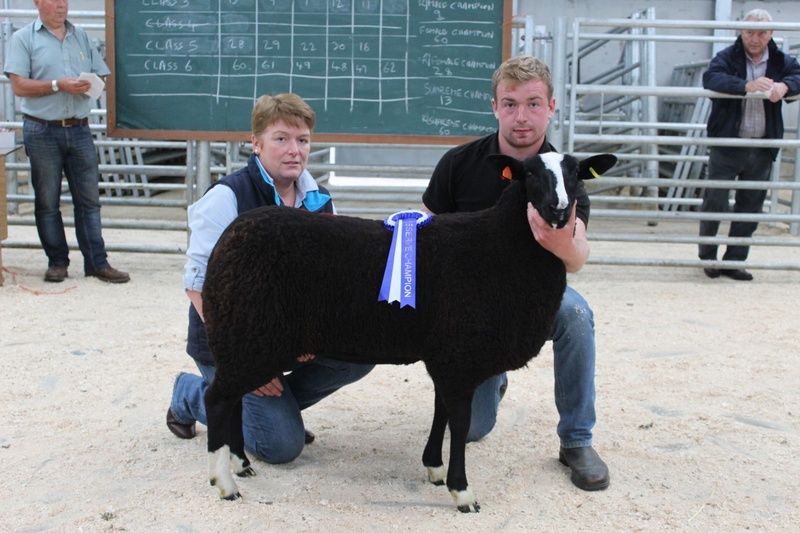 Placed overall show and sale Supreme Champion was first prized ram lamb and male champion ‘Hillview Desperado’ who came from the renowned flock of Mary and Dean Cashel, Co Fermanagh. This December born lamb was described by his breeders as having “a tremendous carcass”. This was later demonstrated in the sale when the hammer went down at 550gns, the second highest price of the night, with ‘Desperado’ selling to the successful bidder, Susan Smith, Newtownstewart. The first prized Shearling ram, again came from the Hillview Flock. This ram that was running with ewes up until two weeks prior to the sale, was by a homebred sire and homebred dam. He was sold in front of a packed ringside for 480gns to Ian Kee, Strabane. The average sale price for males was 220gns with a remarkable 70% clearance, up a considerable percentage on last year. Placed overall show and sale Reserve Champion was first prized ewe lamb and female champion ‘Beechbrook Delila’ who came from Messrs CEJ & S Watson, Cullybackey. This stylish ewe lamb, whose full twin sister is retained in the Beechbrook flock, attracted the eye of many. After a furry of bids she was knocked down to Brian Malcomson, Ballynahinch, resulting in the top price of the night standing at 600gns. 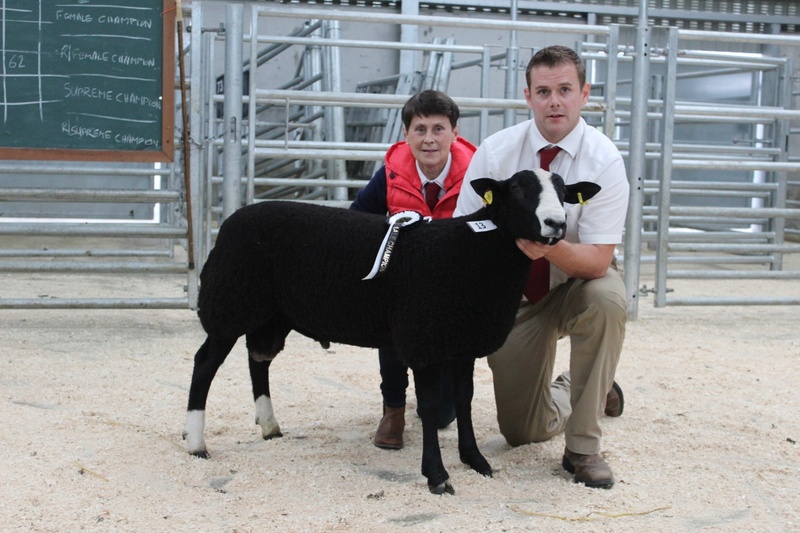 Second priced ewe lamb placed by Mr Preston also came from the Watson Family selling for 390gns, with fourth priced ewe lamb from the Cashel Family selling to W Jeffers, Coleraine, just ahead for 400gns. First and second prized shearling ewe was again from the Hillview flock. With first prize ‘Christmas Cracker’ not making her reserve price, second prize ‘C.Ewe’, who was running with the first prized shearling ram, sold for 450gns. For females, ewe lamb average was a respectable 217gns with a 75% clearance and shearling ewe average was 205gns with a 70% clearance. After the pedigrees, then came the commercial bred Zwartbles. The first lot into the ring were the first prize pair of commercial Zwartbles lambs. 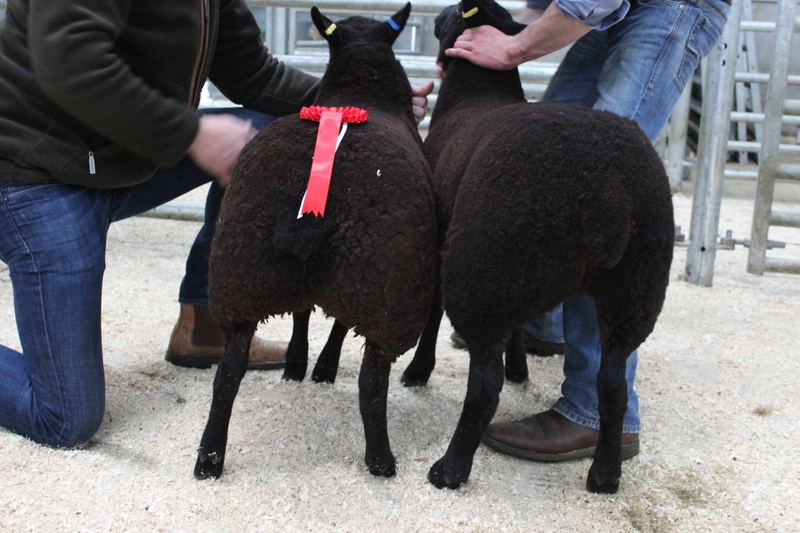 These two ewe lambs bred off a Zwartbles sire and Beltex dam were from Jack Smyth and were sold to Archie Cochrane, Lisburn for £150 each indicating how popular the Zwartbles breed is for commercial use producing tasty lamb chops for the table. Other prices for commercial Zwartbles reached well over £100 bar a few around the £90 mark, highlighting the demand for Zwartbles bred ewes, due to the amount of milk they produce for rearing lambs and also because of their striking appearance. The Northern Ireland Zwartbles Association would like to thank Mr Martin Preston on doing a terrific job at judging the show and they greatly appreciate the continued and ongoing support of the staff at Ballymena Livestock Market and to anyone else who contributed to make the sale a success.